Optimal Seismic Deconvolution: An Estimation-Based Approach presents an approach to the problem of seismic deconvolution. It is meant for two different audiences: practitioners of recursive estimation theory and geophysical signal processors. 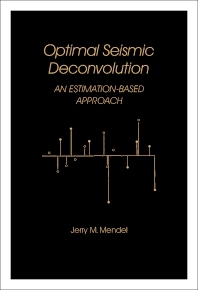 The book opens with a chapter on elements of minimum-variance estimation that are essential for all later developments. Included is a derivation of the Kaiman filter and discussions of prediction and smoothing. Separate chapters follow on minimum-variance deconvolution; maximum-likelihood and maximum a posteriori estimation methods; the philosophy of maximum-likelihood deconvolution (MLD); and two detection procedures for determining the location parameters in the input sequence product model. Subsequent chapters deal with the problem of estimating the parameters of the source wavelet when everything else is assumed known a priori; estimation of statistical parameters when the source wavelet is known a priori; and a different block component method for simultaneously estimating all wavelet and statistical parameters, detecting input signal occurrence times, and deconvolving a seismic signal. The final chapter shows how to incorporate the simplest of all models—the normal incidence model—into the maximum-likelihood deconvolution procedure.